In the early 1950s, the Chinese Catholic Church and the new Chinese government were on a collision course. The government regarded the Catholic Church as a form of Western interference in China. Catholics regarded the Communists as ideological archenemies out to destroy the church. This tension was tragically apparent in the fate of the Chinese Jesuit priest Bede Cheung. Fr. Cheung organized the Catholic Youth Movement and became the leading Catholic figure to resist the government’s attempt to create a "patriotic" (pro-Communist) Catholic organization. He was arrested in 1951 and died in jail three months later. When his family came to retrieve his body for burial, eyewitnesses reported that his body was broken almost beyond recognition and showed signs of torture. His death became an icon of loyalty to the Catholic faith and gave many others the courage to confront the government—courage that was much needed in the violent decades that followed. The government’s suspicion of the Chinese Catholic Church as serving "Western" interests was not ungrounded. Catholicism had come to China in the 1300s and been revived by missionaries like Matteo Ricci in the late 1500s. In the early 1920s, the Chinese Catholic Church had more than a million believers and thousands of clergy. But in 1922, even though 40% of clergy were Chinese, all 41 bishops in China were foreigners. Pope Pius XI finally appointed two Chinese bishops and issued an encyclical affirming that church leadership should be transferred from missionaries to local leaders as soon as possible. In 1949, however, Chinese bishops were still in the minority. The tension between the new Communist regime and the Chinese Catholic Church was heightened by Pope Pius XII, who ordered Catholics all over the world to resist Communism even to the point of death. After all foreign missionaries were expelled from China, many Chinese dioceses were left vacant. Any new Chinese bishop had to be approved by Rome and was required to take an anti-government position —which meant that these bishops were soon arrested. Meanwhile, the government rallied some Chinese Catholics to establish a "patriotic" Catholic movement in order to lead Catholics towards a more pro-government position. Chinese Catholics were squeezed between the authority of the papacy and the authority of the Chinese government. If they remained loyal to the pope, they would be seen as traitors by the government and almost certainly face incarceration. If they were loyal to their country, they faced rejection and even excommunication by the church. Throughout the 1950s, neither Rome nor Beijing would back down. In 1957, Chinese clergy held a national conference hoping to find a way to ensure the survival of the Catholic Church in China. Even those loyal to Rome lamented its paternalistic and highhanded attitude towards the Chinese church. As one senior member said, "Those old folks do not know the situation here. The best thing for them to do would be not to give orders imprudently. We are no children; we know what is right and wrong." The final straw came in 1958 when several Chinese bishops were consecrated without papal approval. Those responsible believed it was the only option if the Catholic Church was to continue to function in Communist China; Pope Pius XII believed it was a challenge to his authority and excommunicated the disobedient clergy. Soon afterwards, the government formed the Catholic Patriotic Association, commonly called the Patriotic Church (similar to the TSPM for Protestants). Those who refused to join the Patriotic Church continued their religious activities in secret and often ended up in jail. One such dissenter was Bishop Dominic Deng Yiming, later the archbishop of Guangzhou (Canton), who spent 22 years in jail—17 of those years in solitary confinement. During the Cultural Revolution from 1966 to 1976, all Catholics, regardless of whether they were pro-government or pro-Rome, experienced a catastrophic suppression. Public Catholic activity disappeared. Many priests and nuns were forced to marry. Chinese Catholics felt abandoned by the rest of Christendom. When China reopened churches in the late 1970s, the division between Catholics reared its head again. The Patriotic Church re-emerged, began consecrating new bishops, and rapidly grew. At the same time, the pope issued a secret order allowing Chinese clergy in the Underground Church to appoint their own successors in a more flexible manner than in the past. The two groups fought over their legitimacy. Each side developed its own leadership, parishes, and seminaries. 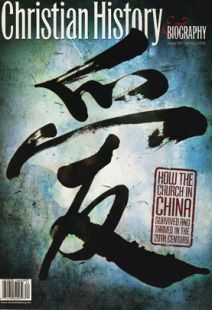 The schism intensified when the pope prohibited the pro-Rome faction from having any contact with the pro-government faction—despite their common suffering during the Cultural Revolution, common witness to the gospel in Chinese society, and common task of caring for the increasing Catholic population in China. Catholics in China must deal with deep emotional wounds as they come to terms with decades of bitterness and mistrust on both sides. Underground Catholics still face arrest. They believe they have paid a high cost in blood to preserve the true faith. If the Chinese Catholic Church becomes unified again and these Underground Catholics find themselves sitting side-by-side with Patriotic Catholics, they will feel betrayed by Rome—their suffering would have been in vain. But the patriotic faction feels that they, too, have suffered in their constant struggle to make a space for the public witness of the Catholic Church under a totalitarian regime. They have felt misunderstood by other Catholics as well as rejected, abandoned, and wrongly punished by Rome, which perhaps did not fully appreciate the difficult situation in which they were living. One fine bishop is so respected by both factions that an underground prelate wrote personally to Rome pleading for him to be approved. As the bishop was consecrated, without papal ratification, he told this author that he was fully aware that he would be bearing a heavy cross. But this is the cross of the Catholic Church in China—the cross of discrimination, misunderstanding, judgmental accusation, historical wounds, and the experience of being forsaken. Still, there are some signs of rapprochement. In 2007, Pope Benedict XVI wrote a letter to Chinese Catholics urging the very thing the two sides most need: forgiveness. Kim-Kwong Chan is the executive secretary of the Hong Kong Christian Council.